Mango and Zara carry some of the cutest graphic tops that still manage to look chic. This particular sweatshirt from Mango was on my radar for the longest time, and I finally impulsively bought it. No regrets though, because it serves as a great piece I can just throw on and still look put together. 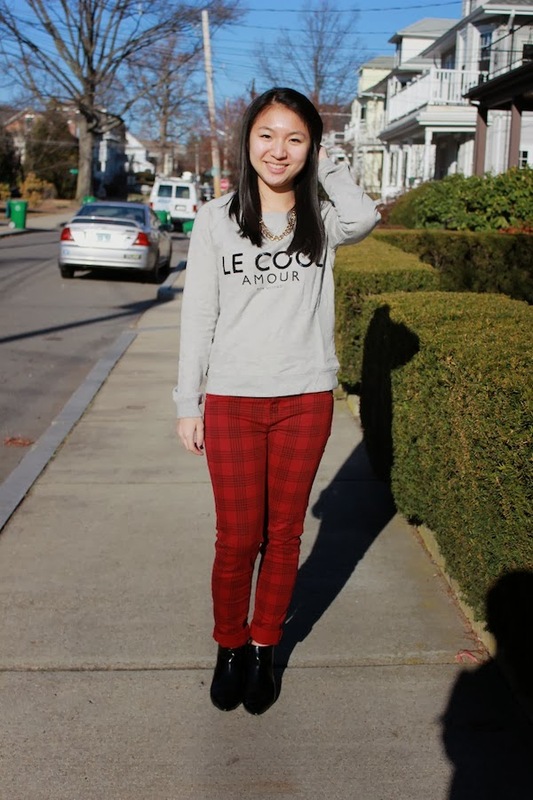 In this case, I paired the sweatshirt with a pair of plaid jeggings from Zara. I love how the current plaid trend can be translated into various pieces of clothing. It is an especially bold statement in these pants! How do you like to wear plaid (if you do at all)? Share your ideas in the comments below! lovelyyy! shall we follow by fbb and bloglovin? I'm sure you can rock plaid!! I've seen your Instagram looks and your style is just fabulous! :) Thanks for commenting! !